Necessity is the mother of invention, as the saying goes. To be more specific, "lack of" is the mother of kitchen experiments. Clotilde's post lamenting the fact that she couldn't get Reese's Peanut Butter Cups easily in France reminded me that quite a lot of the kitchen experiments I do have to do with trying to re-create some food or flavor that I miss, from somewhere else I used to live. I've written about some of these experiments before, such as trying to recreate a good New York bagel. I miss Reese's Peanut Butter cups too, and they are just about impossible to get here in Switzerland. (It's strange that I even miss them, because when I lived in the U.S. I barely ate them at all.) We can get Mar's Bars, Snickers, and many other American candy bars, but not Reese's. So, when I saw Nigella Lawson's recipe for Peanut Butter Squares in her baking book How To Be A Domestic Goddess, I had to try it. The peanut butter squares were great, but I had to start tinkering with it. 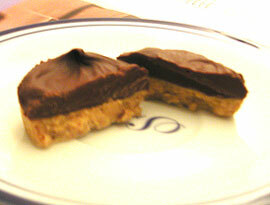 I wanted to make it better than Reese's, more intensely peanutty and chocolately. So I changed the milk chocolate topping to a dark chocolate one, and added some finely chopped salted roasted peanuts to the peanut butter part. And of course, they had to be in cups rather than mere cut up squares (though squares are easier). The result is indeed like an adult version of Reese's. They are also very pretty, and I think quite guest- or gift-worthy. Peanut butter is sticky, oily stuff, a pain to wash up afterwards. I try to avoid doing the dishes as much as possible (Max does it about 90% of the time) so I came up with a way to mix the peanut butter base in a bag. The same bag is used to pipe the mixture into the cups too. It's a lot of fun for kids or adults. These peanut butter cups are very, very rich, so take one at a time and nibble slowly. In an hour, possibly less, you'll be craving another one. The measurements here don't have to be that precise, since there is no actual baking involved. Chop up the peanuts with a knife or in the food processor until they are as fine as you'd like them to be. Put the peanut butter, 60 grams/2 oz (2/3rds of the) butter, peanuts, and both sugars in a sturdy plastic zip bag (don't use cheap thin ones because if the bag bursts, it isn't going to be pretty). Press the air out of the bag and close it. Knead and mix the bag until the contents are completely mixed and smooth. This part of the process is rather soothing and fun to do - you may find yourself doing it for longer than needed (sorry for the pun). Once the mixture is mixed, press down the mixture towards one corner. Cut off the corner with scissors, and twist the bag - now you have a sort of pastry bag. Squeeze about a tablespoon worth of the peanut butter mixture into each paper cup, smoothing out the top of each with your finger. Each cup should be about 1/2 full. It's easier if you keep each cup in the stack of other paper cups for stability while you fill them. Once the peanut butter mixture is all used up, make the chocolate topping. Break up the chocolate into a bowl or a soup plate (the soup plate will allow for faster melting since the chocolate is more spread out). Melt it in the microwave at medium for about 3 minutes. Check at this point; if the chocolate is still hard, mix and nuke for about 1 minute more. Add the rest of the butter, and nuke for another 30 seconds. Mix the chocolate and butter well with a spoon until smooth. 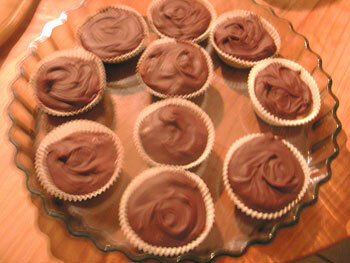 Fill up each cup with the chocolate, smoothing out the top with your finger or a knife. Try not to lick your fingers during this whole process, unless of course you plan to eat all the cups by yourself, in which case it probably doesn't matter. Cool in the refrigerator until the chocolate is firm, about 1 hour. Store in the refrigerator until all consumed. The way is goes like this: you go to the refrigerator. You mean to take out the water bottle, and accidentally take a peanut butter cup. Repeat every hour or so. Any other occupants of the household will do the same. Note: if you would rather not put in peanuts, increase the amount of peanut butter by about 1/2 cup, and add about 1/2 teaspoon of salt. You can also use chunky style peanut butter (which is rather hard to get here in Switzerland), increasing the amount by about 1/2 cup. Submitted by maki on 2004-03-12 06:14. Hello, I quite like your website. I think your site is fun for me because i lived in Paris too (Villiers) and also in Fontenay-aux-roses. I miss it. Oh i was wondering if the "icing sugar" is the same as "powdered sugar", and also if the dark chocolate is semi-sweet or just regular? Thanks! Hi cpr. Yes icing sugar is powdered sugar. For the chocolate I used dark chocolate, not milk chocolate. I'm not too sure how it compares to semi-sweet, but it's quite a dense chocolately flavor, with 50% cocoa content. (The brand I used is called Caillers (owned by Nestlé, but Lindt also produces a similar kind of dark chocolate - here in Switzerland it is called Cremant.). You can use other types of chocolate instead if you prefer a less "dark" chocolate. Hey Maki, I love reading your site and have just started trying out the recipes (I have a plate of reheated stuffed bread on my lap as I type!). A question on this one: you say to put the butter in the bag with the peanut butter, then you say later to mix the butter into the chocolate. Do you split the 3oz butter between the two steps? Thanks for providing some great foodie writing. Hey! How come I just noticed the comments now? Liz, I have put in the corrections - thanks for pointing it out! You inspired me to make these and they turned out great! My husband and I are Americans living in Paris and we really miss our Reese's peanut butter cups. In our opinion, the most "accurate" cup is a 1/3 to 2/3 ratio of chocolate to peanut butter. What do you think? What you're making is very similar to buckeye candies. I can't begin to tell you how happy this recipe makes me. What a great idea to mix the peanut butter in a bag! I'm going to give this a try with my step-daughter (10 years old) when she visits at Easter. Thanks! In Geneva, I relied on the store at the American Mission to the UN for all sorts of things from candy to fluff. Your solution seems to take it with a bit more grace ;). hmm, on a similar note, I found myself craving McDonalds egg mcmuffins. I made homemade "american style sausage" with minced pork, ground streaky bacon, fresh sage, paprika/salt/pepper and a shot of maple syrup, then fried it up. Put it in a casserole dish, layer of cheddar cheese and then poured over a mixture of beaten egg, touch of cream, salt and pepper and put it in the oven. Your recipie looks good though, guess I will be doing a comparison at the weekend. I simply love your site. Every page I visit is a delight. I will especially enjoy trying this recipe this week for my twin grand-daughters first birthday next weekend in Newport. Love your colors and sense of humor. What do you mean by shallow paper cups? What do you mean by "shallow paper cups?" Are those the cupcake papers you put in cupcake tins? Or paper cups that you would drink out of? Linda, I mean shallow cupcake cups as seen in the photo. Wow! I made these for when my brother visited me, and they were AWESOME! My brother LOVED them and could not stop eating them! Thanks for such a fun and delicious recipe! I made these last night and they turned out amazing. (: The peanut butter I had was...too oily and the peanut butter didn't quite set in an hour, but after spending the night in the fridge they're perfect. Small question though, is the butter supposed to be melted when adding it to the peanut butter mash up? Wasn't sure, so I melted it so it could mix faster :D They were lots of fun to make. The butter doesn't have to be melted actually. As you mash the mixture together in the bag with your hands, your body temperature should soften the butter enough so that it melts into the mixture. Glad it went well for you in any case! Thanks! (: I'm gonna make these as soon as I get home for Christmas too :D I'm sure everyone will love them! i really do love you website, it is really inspiring to me. i altered it by adding half a cup of boiled still hot cream, easy tu squish out of the bag and still gets a bit stiffer when cooled down, just gave me the perfect consistency for the filling, yum. I wish you all the best for x-mas and a happy new year, and good health!